They say that anything can kill you these days. The poisons that we use in our homes, the plastic water bottles we use everyday, the questionable ways that are food is grown and sprayed with insecticides. I think we all know that many of these things in modern life should be avoided, used properly, or thoroughly washed. But, when it comes to walking though the Full Body Scanners at the airport, most of us don't even give it a second thought. The government says that the radiation put off from these machines is less than we would receive flying at cruising altitude for just a few minutes. So, what's the issue? Don't believe everything you are told, especially about Full Body Scanners. Unfortunately, this is deliberately misleading. A closer look into millimeter wave technology and the ways in which it affects the human body during an average TSA screening reveals a truth that the government doesn’t want you to know. The doses of electromagnetic radiation emitted by the TSA’s millimeter wave technology machines can cause gene mutations, nerve damage, sterility, affect the immune system, and even cause cancer. 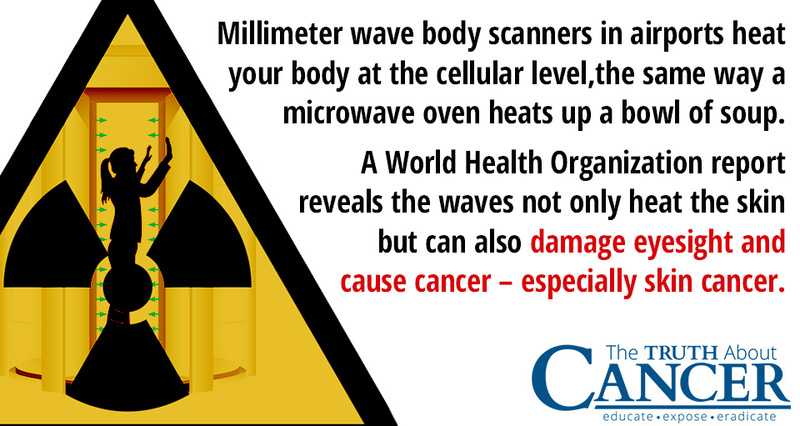 A World Health Organization report reveals that millimeter waves not only heat the skin but also damage eyesight and cause cancer, particularly cancer of the skin. Bottom line - Air travelers, when faced with the Full Body Scanner at the airport, should Opt-Out and choose a manual pat-down instead. Even though it's physically invasive and admittedly unconstitutional, air travelers can minimize their radiation exposure and thus minimize the risk of developing cancer by not subjecting yourself to these Full Body Scanners.